The Willow Gallery is excited to welcome a variety of enthusiastic, professional artists to run a wide range of courses in their specialised area of expertise. We hope you are able to make the most of this fantastic opportunity. For further information on any of the courses below or to book a place, please contact the Willow Gallery. Advance booking is highly recommended. This workshop offers a fantastic opportunity to learn a variety of Willow weaving techniques from these two inspiring practitioners. Helen and Kalvin have over 15 years of Willow Basket Making and Teaching Experience and are keen to share their knowledge and expertise. Create your own Willow Basket to take home. Gain inspiration and ideas for future willow weaving projects. Have fun learning how to sew different stitches and produce your own embroidery patterns. Take home what you create and make the most of this rare opportunity to learn a new skill. Develop skills in a wide range of wood carving techniques whilst learning how to carve your own traditional love spoon. Throughout the session you will also gain ideas and techniques which can be used for other wood carving projects. Jim’s enthusiasm is sure to make this an inspiring and enjoyable workshop. Explore the fascinating world of felt making with expert guidance by Sue Mulcock. An introduction to making Felted vessels and experimenting with a variety of British wool types and Felt making techniques. Create your own felt vessels to take home. Gain inspiration and ideas for future Felt making projects. Learn how to understand your camera, and take better photographs with the camera you own whist developing skills in lighting and composing a photograph. £12. Please bring along your own digital camera. Have fun experimenting, exploring and creating. Each week we will cover a different project including drawing, painting, clay, sculpture and printing. Learn about different artists and techniques with like-minded young artists. £6 per session including all materials. Working from a live model, each session will include tuition on using a variety of media to describe the human form. Take advantage of expert tuition and demonstrations or pop along to work on your own project and ideas. £7 a session including basic materials, students are welcome to bring their own mediums. This vibrant exhibition will be showcasing work from a variety of local artists. It will be a celebration of movement, music, energy and the natural world expressed in a wide range of media, including sculpture, oils, ink, acrylic, pastels, collage and photography. Rhythm and Dynamics will be running for eleven weeks. Keep an eye on how the exhibition develops as new work will be on show at different intervals. Phase One: Featuring work by: Bridget McLaren, Dawn Field, Des Jones, Jean Napier, Jenny Jones, Jim Heath, Katharine Laird, Llewellyn Cumings, Lavinia Range, Malcolm Tillis and Stephanie Jacobs. Local landscape oil paintings, capturing the detail and atmosphere of the local landscape. Documenting his travels through photography, Tony captures majestic mountain vistas. Celebrating Spring Flowers through her beautiful botanical illustrations. Stunning and affordable glass work by these two expert practitioners, be uplifted and inspired by this fascinating medium. We are excited to welcome Lindsay Chaplin from Lindsay’s Cakery to the Willow. She will be serving scrumptious cakes, delicious home cooked lunches and savoury snacks. Quality ingredients will be locally sourced where possible. A range of speciality loose-leaf Teas and fair trade Organic Coffee will also be served. Pop in to enjoy the relaxed atmosphere of the newly refurbished, bright and spacious Willow Eatery, located within the Willow Gallery. Take away food and drinks will also be available. The Willow Gallery shop is a treasure trove of beautiful and exquisite, locally hand-crafted gifts. We have a range of showcase jewellery, textiles, ceramics, wood turning, cosmetics and limited edition prints. Discover that unique card for a special someone from our selection of handmade and original greeting card designs. Colourful earthenware ceramics inspired by Kandinsky, Miro and Picasso. The gallery is launching an exciting programme of ‘Artist in the Gallery’ events and we would be very keen for you to be involved. Every Saturday or Wednesday we are hoping to have an artist being creative in the gallery. This may involve sketching, sewing, knitting, hand throwing pots, card making, silk painting, painting etc… This should be a great opportunity for artists to be able to, share what they do and further promote their work. This will also enable gallery visitors to gain an insight into the creative process and understand the time and skill involved in hand crafted items. Any artist working in the gallery will be promoted on what’s on and gallery website/blog, If you would like to be involved then please contact the Willow for further information. 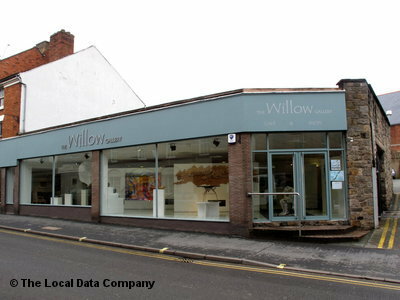 The Willow Gallery CIC is a not-for-profit organisation run for the community, mainly by volunteers. If you are interested in volunteering at The Willow or would like to support the Willow in any way, either through a donation or your time, then please contact the gallery. Any support is much appreciated. « Calling all Artists – Moo.com have a sale! !